Top quality experienced resources to support Windows and Linux based control panels and servers. Deeper understanding of all widely used Control Panels. All admins have done MRS (Minimum Requirement Skills) for hosting support. Replacement guarantee within 24 hrs if any of the team members is not performing according to your expectations. One project manager available all the time to resolve any internal issues. We have a 1MBPS Leased Line Connection from one of the leading Internet Service Providers in India and also have 2 backup internet bandwidth from another provider in India. This means we have 3 different providers in our office which makes for very good redundancy. We have a complete power backup for all our equipment (computers etc) for up to 72 hours. We have 3,000 sq feet of built up space for our office We are a financially strong and debt free company and part of a major business house of India located in the Nasik district, state Maharashtra. Our expert systems administrators and technical staff handle any issue or question you may have within an average of 30 minutes, 24 hours a day. 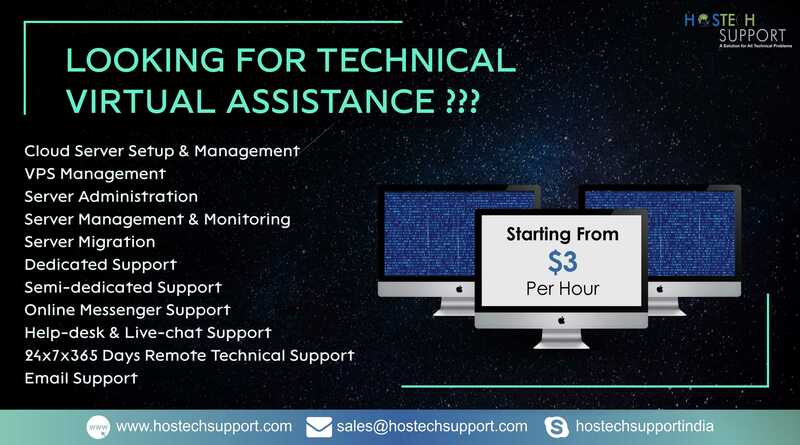 You will always deal directly with an expert because we do not employ ‘Tier 1′ support staff.We, at HOSTECH SUPPORT.COM, have team of expert developers and technical support guys with expertise and wide dimension experience in the relevant field to provide you the world best quality and world best solution for your technical problems. Select the Dedicated plan and review the resumes of available resources. Select the resources that suite best to you and schedule the interview Talk to the resources online (chat + webcam) or via phone Take a peek at the workplace via live CCTV, watch your team working 24×7 on your mobile, PDA, laptop or computer. Sign NDA and SLA for assured service quality.